Children: Two daughters Ellis, 10 and Maeve, 5. I grew up in northern Vermont and went to undergraduate school in western at the New York State College of Ceramics at Alfred University (NYSCC). From there I took a year off to work on my application for graduate school and then went to the University of Massachusetts, Dartmouth for two years. This was a three-year program and shortly into my second year I realized that the program was about to go through some major changes. Chris Gusting had announced his retirement and the program’s direction was in flux. During my second year of graduate school at UMass I decided to apply to NYSCC’s graduate program. So, after two years of grad school at UMass I ended up doing two more years of grad school back at Alfred. My parents and many of their friends went to art school and had settled in Vermont in the late 60s and early 70s as part of the back-to-the-land movement. Many of the mothers I was around growing up were also artists: painters, sculptors, potters. My mother included. She had gone to school for painting and taught elementary art. I first started making pottery when I was 13 after school with a neighbor who had a studio connected to her house. She was also a mother and I often got off the bus with her son. This integration of work and life was something that resonated with me. I responded to it and wanted it. Seeing it modeled so early in my development helped me to understand what I aspired to do professionally with my life. Certainly, my mother, Cacky Peltz, who always wove wonderful, creative projects into my brother and my childhood and still does with her grandchildren. Lucinda Rochester Smith, the potter I apprenticed with through high school. Later, I met John and Andrea Gill who were inspirational as a couple working together sharing a job, parenting and making time for their studios. A sentiment of Andrea’s has kept me going through these early years of parenting. She said “don’t forget you are still an artist even when you haven’t made work for a few weeks or months or even as long as a year”. This certainly helped me during the hiatus that occurred when I was pregnant and my children were born. Karen Karnes was inspirational as someone who had had a child and continued a committed studio practice. She actually was not as supportive of having children as others in my life but the fact that she never seemed to falter in her studio has always been incredibly impressive to me. Has being a mother changed anything about your studio practice? If so how or what is different? Do you find inspiration through the practice of mothering? If so has any of this influenced your studio work and in what ways? Being a mother has changed everything about my studio practice. Before the birth of my children all of my focus was on making my work. Graduate school had instilled this in both my husband, Todd Wahlstrom and I. We met at Alfred and went through the graduate program in ceramics there. Our vacations would be visiting museums, going to NCECA or a pottery show. Time at home was working on building our studio or making work. When our children came, this changed dramatically. The birth of our first child coincided with my getting a teaching job at Bennington College. The studio balance had to shift dramatically with these changes. We decided the best schedule for our family would be that I work 3 to 4 days a week. The one semester a year I taught I did not work in the studio, the rest of the year the kids were at day care or with a baby sitter 3 to 4 days a week. This is the first year that they are both in public school Monday through Friday. I anticipate this will be a welcome shift in my studio. I have found what has been most difficult in my studio practice is finding the time for research and development. My forms evolve and develop out of a focused process of throwing and investigating forms that are, often, not functional. Finding this time has been difficult for me since the birth of my children and this way of working does not give results for shows and sales. Growth has felt slower so my process has been more about revisiting and refining of ideas. 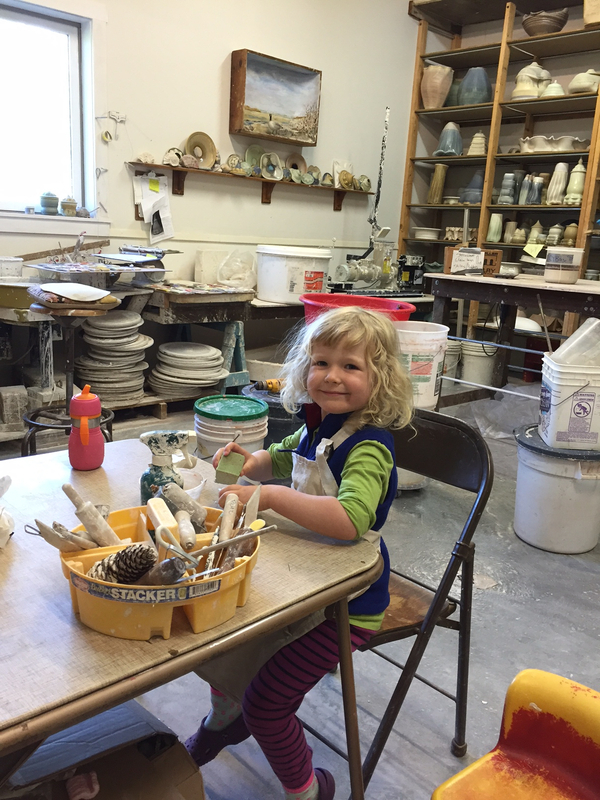 Can you talk about how you balance your roles as an educator, artist and mother? Did you take time off after the birth of your children? How did that work? What about childcare? How did you navigate making artwork? My second year of teaching at Bennington began six months after my first child, Ellis, was born. This was a crazy transition. I would drive, with her, the hour over the mountain, set her up with a babysitter in a house right off campus and try to nurse on either side of my four-hour class. It was pretty miserable. Ellis was not happy to stay with the sitter and I would be pretty engorged after four hours of teaching. I remember many trips home at the end of the day with her screaming for the whole hour long car ride home. My second child, Maeve, was only three months old when I went back to teaching. This time I left her home with my husband and mother. This helped a bit but my girls were big nursers and they nursed for years. Teaching long studio classes with an hour commute on each side did not fit well their nursing schedule. Those were stressful times. Now with a 10 and 5-year-old who are in school our schedule works better for us all. I think becoming a mother has made me a better teacher and being a teacher has made me a better mother. Both activities, teaching and mothering, are so much about listening and offering the right advice at the right time. While I know I never get it right all the time I am often using examples of those activities to illustrate or clarify a point to either my students or my kids. I share anecdotes from home or college to bridge the gap between the two; having my kids understand my days at work and using examples from home (often studio related) with my students to explain the life of an artist. Can you tell us about the New England Hardboard Company? How did the company start? What is your involvement in the New England Hardboard today? Has it changed or enhanced anything in your creative practice? New England Hardboard Company is the name of a business that was started by my husband’s grandfather in the 1960’s. When Todd and I were in graduate school we would use the family business, New England Hardboard, located in Worcester, Massachusetts to make throwing bats. We worked weekends and after hours using scrap Masonite to make hardboard throwing bats. Throwing bats are disks that potters put on a wheel-head to make pots on. We sent these to customers from wherever we were living. In 2000 we moved to Vermont and built a building that could house this business and our studios. We adopted the family name, New England Hardboard. Early on, I was involved in the manufacturing. Todd would cut sheets of Masonite into circles and I would punch press holes in them and box them up. Since our children have arrived I am no longer part of manufacturing but continue to do the books and some of the office work. We started the business as a way to take financial pressure off our studio practices. It was a way for us to produce a product we understood and sell to schools and suppliers we were familiar with. We have grown the business significantly since then. Products are now made by an employee on a CNC router. We have several lines of throwing bats carried by suppliers nationwide and this summer we will launch our own e-commerce site, http://studioprobats.com/. This will expand our lines of throwing bats and include other new innovative products for potters. The New England Hardboard business has helped us continue to work in our studios but the balance is always a struggle. As a business, it could always use more of our time and our studios always feel like they need more time also. You wrote a piece for the Studio Potter Winter/Spring 2017 volume dedicated to the theme of Women in Ceramics. Can you talk about your writing titled, Musing on Making and Motherhood? What was the catalyst for this piece? What did you learn through the process of your writing? What advice could you give mothers of young children as the think about their studio practice and maternity? 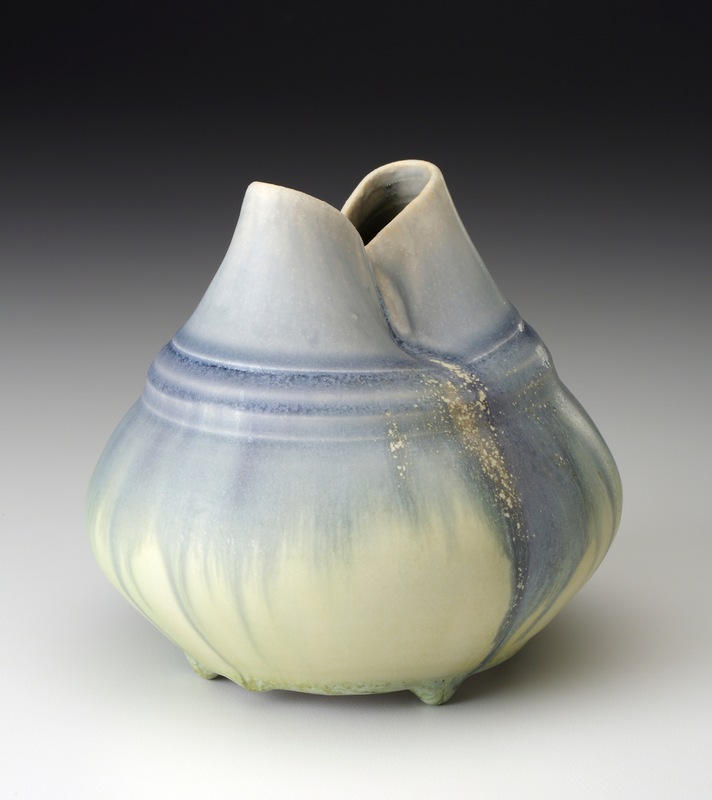 I got the idea for writing the piece for Studio Potter because Karen Karnes had recently died and I was feeling emotional about her passing and the role of women in ceramics. I wanted to say something in this conversation about women in ceramics and realized that much of my recent focus has been on the balance between making and being a mother. Relinquishing the selfishness, I enjoyed in my work as a truly full-time artist is a difficult process. Still, I chose to become a parent and happily embrace the role. As time goes by it is easier to accept who I am and not feel overly critical about who I am not. I am not sure what my advice would be, everyone is so different. I feel like you need to be in it to realize the immensity of how having children changes your life. I do think that the early years go quickly. Often the advice you hear from others is to not miss those early years and take all the time you can with your children. But for me, I needed to keep something of my studio practice alive to feel whole and connected to the person I was before I was a mother. The balance was a half week split. It allowed me to feel like I was able to still be with my children much of the time but also keep my studio practice somewhat active. 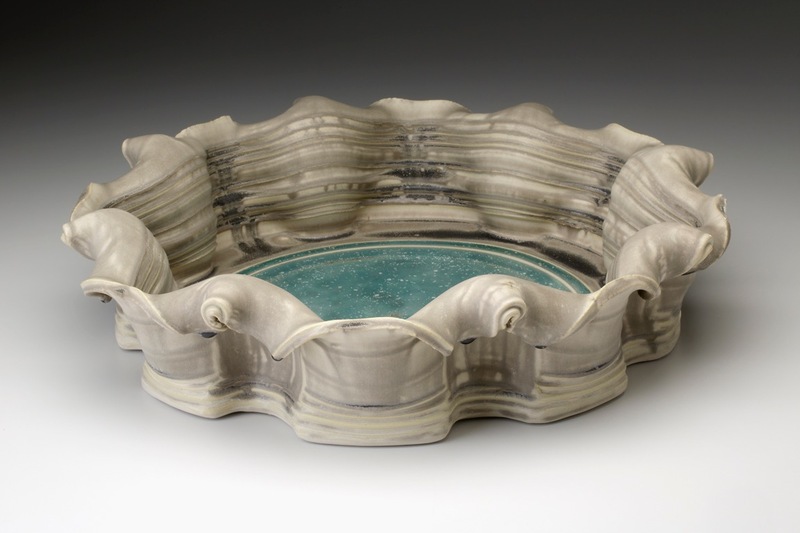 The Old Church Pottery Show and Sale in Demarest, New Jersey is an iconic ceramic event. Can you talk about the experience of participating in this show? How would you describe the legacy of Karen Karnes? Has her legacy impacted you and if so how? 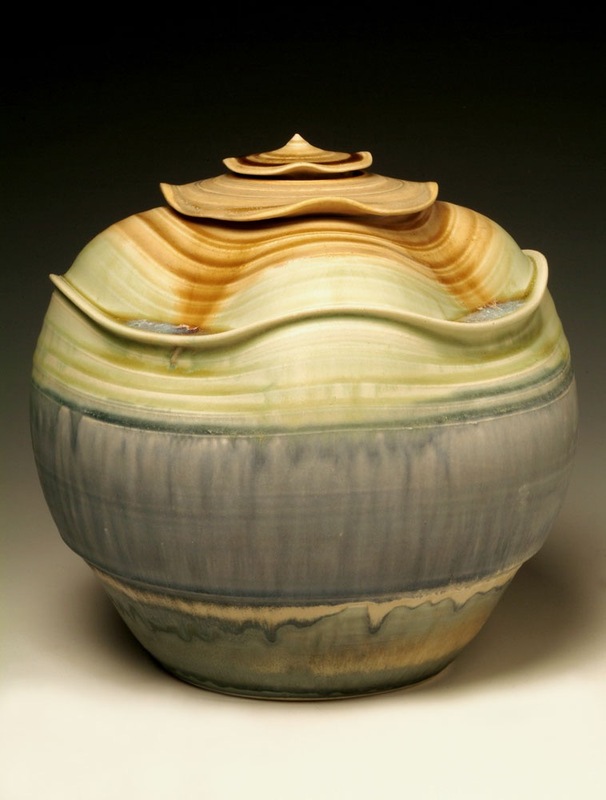 Karen Karnes’s pottery has resonated with me since I was first introduced to it as an undergraduate student. I saw many pieces of hers at a show of her work in Stowe, Vermont in the early 90’s. That was a significant experience for me. Before then I had primarily understood my pots as being functionally-based. Seeing Karen’s large split footed forms and winged vessels was extraordinary; their mass, strength and soft femininity resonated with me. These forms were representational of vessels but explored form in a much more sculptural way than I was familiar with. The fact that these pots were also created by a woman made them all the more vital to me. I was invited to do the Old Church Pottery Show and Sale for the first time in 2004 and have done it a handful of times since then. This was a show that I had visited as a student to see a large amount of strong work from across the country. Being invited to be part of it was a great honor and humbling to be showing with such talented artists. Karen was never big on critiques. We would joke that a good critique form Karen was her simply pausing at your table during the sale. Karen has left a legacy that includes this model for showing ceramic work. 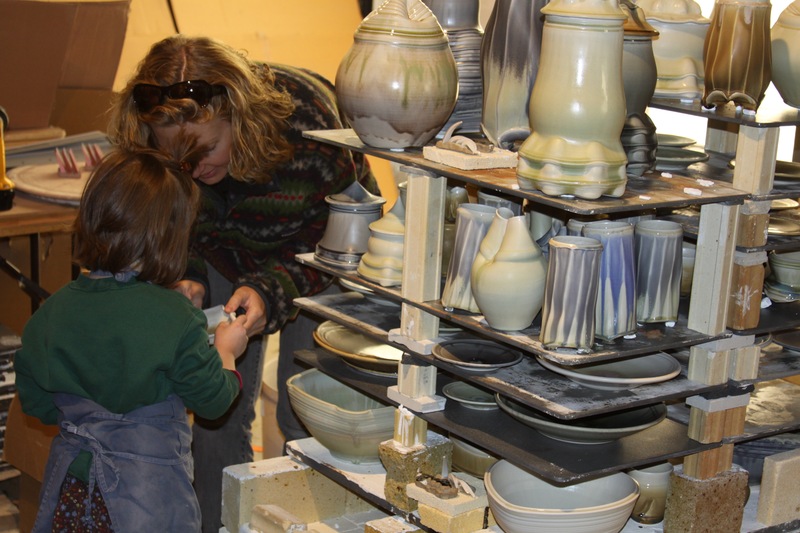 The Old Church Pottery Show is going on its 43rd year. 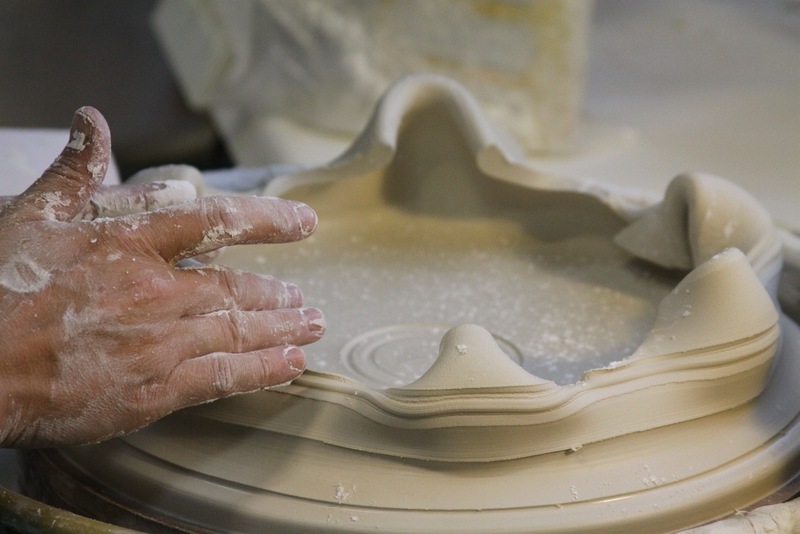 There are now many pottery shows like it happening throughout the country. 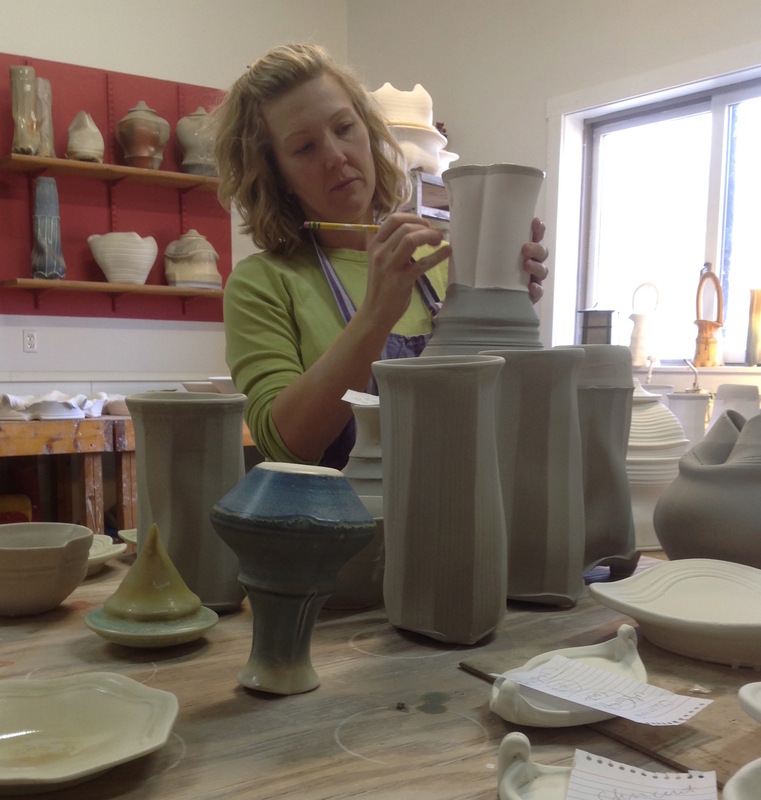 Such as the Worcester Pottery Invitational at the Worcester Craft Center. This show began with the blessing of Karen in 2003 and has continued on and off since then. Todd and I have curated the show for the past two years. 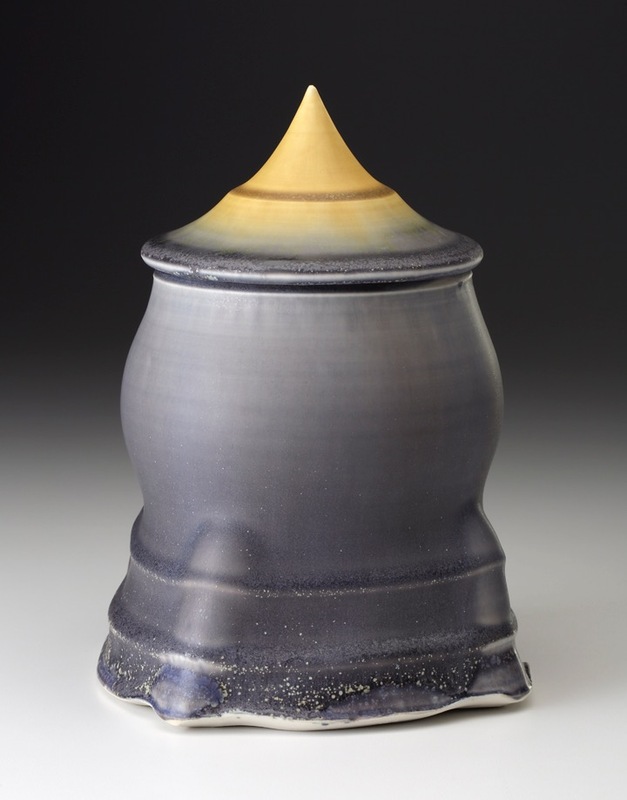 Karen strongly believed in the Old Church show providing an environment for potters to come together to connect and share with other potters. 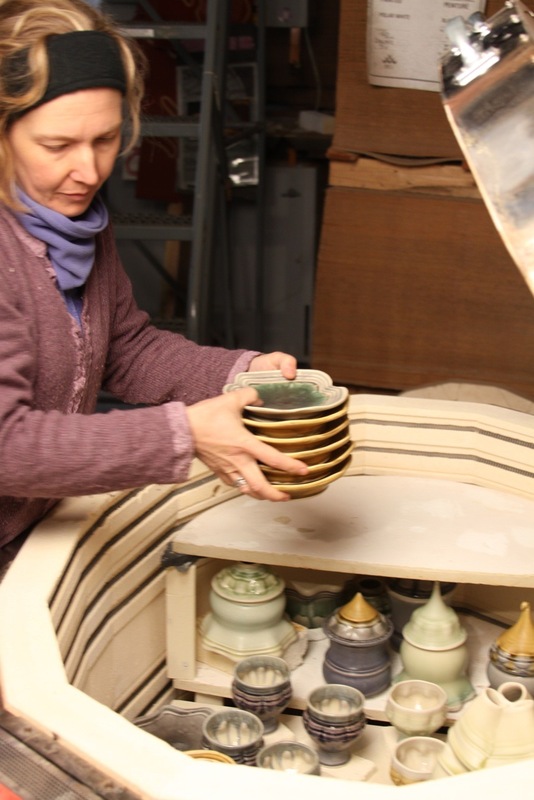 We have kept the Old Church model and Karen’s philosophy in mind while we gather a strong, diverse group of potters to represent what is being made in functional ceramics today. I run with a good friend and neighbor as often as I can, usually 3 to 4 times a week. I have found that regular physical exercise is critical to maintaining a life-long studio practice. My husband and I are active volunteers in our community. I am on a local board for after school programming and have been a library trustee at our local library. We also organize our town’s Green Up Day which is a fun, community activity of cleaning up the roadsides in the early spring. This involvement has been a great way to connect to our neighbors and make friends in a town that we are still, 16 years later, relative newcomer’s too. I am not sure how much these activities feed my practice as much as my soul. Friends, community and connection all help me to feel grounded and part of something larger. 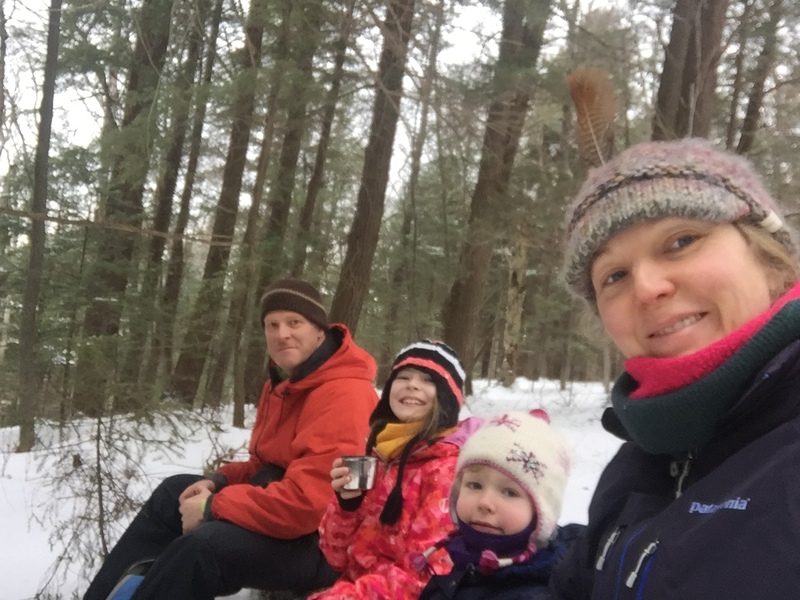 It is great to be featured as Mother of the Month for this blog but in writing this I realized that many of the “I” statements are actually “we” statements. So much of my life is only possible because of the partnership with my husband, Todd. We have been on this journey together for a long time. We met in school and learned to be studio artists and business owners together. When our children came, we continued to learn to be parents together by communicating, sharing and divvying up the jobs that needed doing. I am incredibly lucky to a have a partner who is so involved and supportive.